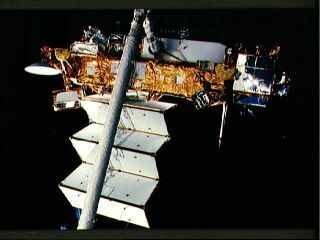 The agency's Upper Atmosphere Research Satellite, or UARS, is expected to make landfall tomorrow, and while the threat of any debris falling over populated regions of the planet is very remote, the event has highlighted the ongoing issue of junk in space, and the need to promote sustainability and situational awareness in low-Earth orbit. Or at least orbital debris experts hope so. SPACE.com: This is not the first time that an old, out-of-commission satellite or piece of orbital debris has fallen to Earth. A 6.5-ton spacecraft is very large, but it's not unprecedented. Why do you think UARS has captured so much public interest? Ray Williamson: I think because we're not used to these big satellites coming down. There are not that many, and whenever it occurs, it's always a good idea for NASA to let people know that it's happening. In this particular case, for example, there's not a whole lot to worry about, but it is worthwhile being aware that it's happening. SPACE.com: In your experience at the Secure World Foundation, what similar events might you compare this to? SPACE.com: Why has it been so difficult for scientists to predict where pieces of the UARS satellite are going to land? What you'd see if you could see all this happening close-up, is the pieces slowly coming apart and a trail of light, because it's heating to the point where the aluminum structure melts. Also, it's coming into an atmosphere that is not uniform, so since we don't know precisely the structure of the atmosphere and what it's hitting, there will probably be uneven heating on the satellite. Think about the pictures that you see — the artist's conception — of the Apollo capsule landing. If you remember seeing some of those, it was designed in such a way as to come into the atmosphere bottom first. There were ways to keep it on target as it came back, but you see this very uneven heating over the bottom of it. SPACE.com: NASA has said repeatedly that there is very little chance that debris from UARS will fall on densely populated areas of the planet. But with all the unknowns that you mentioned, should people still be concerned? The story I like to compare it to is the breakup of Columbia. When [space shuttle Columbia] came back, as the shuttle heated up, it broke into pieces — some very large, and some very small. Even then, there was difficulty in trying to find the pieces that were spread over such a large area. It was such an unpopulated area that it was very difficult to locate all the pieces, even though they knew from videos pretty much precisely the track that it followed across the atmosphere. SPACE.com: Is it feasible, or are there any benefits, to destroying the UARS satellite before it even enters Earth's atmosphere? Williamson: People have raised that issue, but I don't think so. For one thing, it doesn't send a very good political message. How would you destroy it? Well, you'd do what the U.S. did with USA-193, which was a classified observation satellite. There, the stated public reason for destroying it with a missile was that the satellite had large amounts of what was, by that time, solid hydrazine. If that fell in a populated area, or even in an unpopulated area, it would be dangerous to people because it's highly toxic. But there were people who also said this was an ASAT (anti-satellite weapon) test on U.S. terms done at a very low atmosphere, and frankly, I think they got enough negative feedback from other countries. You just illustrate to other countries who might want to demonstrate their ability to create an ASAT (anti-satellite weapons) in the guise of something else to demonstrate the technology. We want to stay away from that. Each dot represents a bit of known space junk that's at least 4 inches (10 cm) in low-Earth orbit, where the space station and shuttles roam. In total, some 19,000 manmade objects this size or bigger orbit Earth as of July 2009; most are in low-Earth orbit. Countless smaller objects are also circling the planet. SPACE.com: Do you think the uncontrolled re-entry of UARS has highlighted, not just to members of the aerospace industry but also the public, the issue of orbital debris? SPACE.com: When did agencies and governments begin to realize that orbital debris had become a critical issue? Williamson: I don't think you can point to one event, but if you wanted to, it would actually be two events that came fairly close to one another that caused people to think about it. The first one was the Chinese ASAT destruction of a satellite. By January 2007, when that took place, people in the industry and government who were space experts knew enough about debris and had it high enough in their thinking that they said, 'Hey, this is not only a wake-up call about a possible space weapon, it's also a wake-up call about additional pollution in space.' When Russia exploded some satellites in orbit, there wasn't that much appreciation of how that debris could grow. The second dramatic event, of course, was the 2009 (February) event where the U.S. Iridium communications satellite and the Russian Cosmos satellite collided accidentally. That sort of woke people up, and the response has been pretty dramatic. For instance, the Air Force has put a lot more money into debris tracking because the idea that if we keep an eye on all the debris around working satellites, we can move a satellite if it looks like there's going to be an impact. SPACE.com: The U.S. Air Force Space Surveillance Network keeps a pretty extensive catalog of orbital debris, so would you say we have a good handle of what's out there? Or is there more that we just don't know about yet? Williamson: The Air Force tracks some 21,000 pieces of debris. The official catalog says there's about 16,000 pieces of debris where we can trace the origin. So, there's simply some that the people who follow this in NASA and Air Force haven't yet determined with a reasonable doubt where that debris comes from, so they won't put it in the catalog until then. There are roughly 1,000 working satellites in orbit, and they follow all of these satellites as well as all the debris, so they can do what is called a conjunction analysis to see if any debris and a working satellite might collide. They can then try to predict ahead of time when that might happen and let the owners of the satellite know. This wasn't in place before the Iridium collision. Had this been done beforehand, that Iridium satellite could have been moved. SPACE.com: Have we reached a tipping point with orbital debris? SPACE.com: UARS was launched in 1991 before people were really concerned about space debris. Since then, what are some steps that are taken now to avoid having to deal with an uncontrolled re-entry of a satellite at the end of its life? Williamson: The biggest one is to leave enough fuel in the structure to bring it back down in a controlled way. Basically, satellites don't fall down of their own volition. We say that in general speech, but they can't just fall down — they have to have some sort of pressure on them or force, and it has to do with drag. You have gravity always trying to keep it close to Earth, and then you have the velocity of the satellite always trying to go in a straight line. So, it's continually being bent back by gravity, but it's also being affected by the upper atmosphere. If you want to keep your satellite in orbit, you have to keep boosting it up with a little bit of fuel. SPACE.com: There have been proposals submitted for different ways to clean up junk in space, but some seem like the stuff of science fiction. Have there been any proposals that have caught your eye that you think would be valuable to really consider? Williamson: I haven't really seen one that I feel would fit the bill. I mean, frankly, any effort to remove debris from orbit always risks creating more debris than it cleans up. I haven't seen technology that would do the job in a way that would be responsible and cost-effective, and the biggest item is cost. Even if you created technology that is safe and can actually pull down some debris and make the situation better, you run into the problem that it's not cost-effective. If you can add fuel to it and so forth, you can also perhaps clamp on a propulsion package to a dead satellite and send it to a higher orbit, which would effectively get it out of the way, and it would stay up there for many thousands of years. There are some technology people beginning to become really interested, but the cost issue is the real bear. But, the other thing that one worries about at that point is if you create one heck of an anti-satellite device. It's dual use, so that's the third issue for me. Any time you can have a removal from orbit, you also run the risk of making an anti-satellite weapon, and then you have a hard time convincing people that it's legitimate.